Will the UN Climate Change Conference in Paris bring car makers to look for new ways? Some say that trillions of dollars in the 'conventional carbon economy' will evaporate when governments take measures to curb global warming. Can the car do both: keep what's good and reverse what's bad?... It can do way more! Cars represent the freedom to go wherever and whenever you want to. However, they come at a steep price. Although not the world’s biggest polluter, traffic is of direct influence to our living environment, and it is the sector where energy and resources are wasted like there’s no tomorrow. How’s that? Well, during most trips the driver is the car’s only occupant. The car weighs approx. 18–30 times more than that single occupant does. To make things worse, most cars are as wide as the driver measures lengthwise, causing the sort of gridlock witnessed every day. Except for being electrically propelled, the Tesla S is by no means better, as can be seen in the picture. Sure, car- and ride-sharing can make car usage more efficient, especially in combination with self-driving vehicles that more or less function as public transport then. Most cars are used only 5–10% of the time. Sure, electric drive will reduce emissions, usually on the basis of fossil-fueled energy plants though. Can we do more? Something more substantial? Yes, we can. 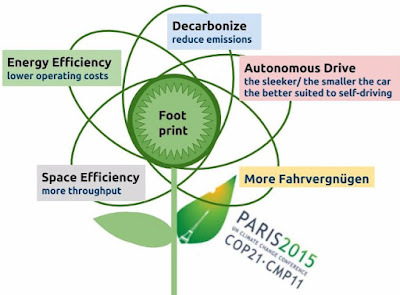 Reduce footprint. Free up space. Ditch weight. Slice battery costs. Further reduce emissions. Win back the freedom that got lost, even experience more Fahrvergnügen. 1. By making a vehicle sleek, freeways in particular can be utilized more efficiently. 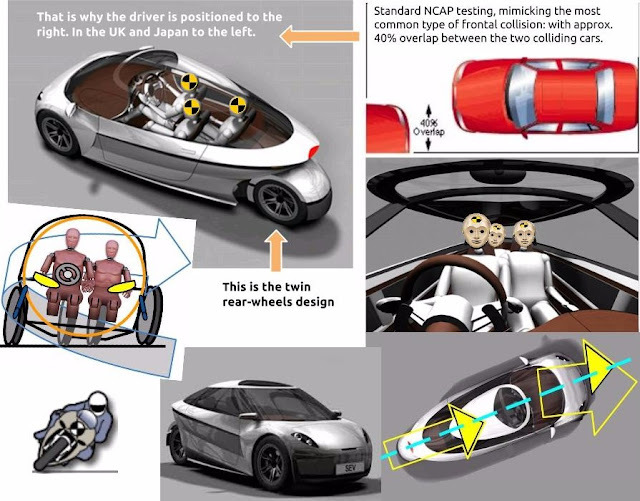 Think of the vehicle depicted here as the safer, peppier, comfier, easier-to-engineer (!) 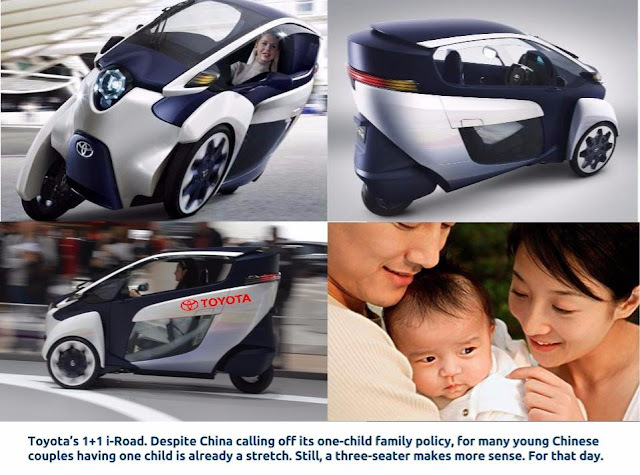 three-passenger version of the i-Road the world’s largest automaker Toyota will roll out in the coming years. 2. Weight can be sliced by 50–70%, without compromising passenger safety and structural rigidity. In fact, safety can be improved! Comfort ditto (notice the long wheelbase). 3. This means that considerably less energy is needed to propel the also low-drag vehicle. A small electric motor will do. Ditto a smaller battery pack. 4. The sleeker (and smaller) the vehicle, the less likely it will run into other road users and vice versa. Together with great all around visibility, it will be ideally suited to autonomous drive, making it a true auto-mobile. 5. If share-used, such a vehicle can be eco-friendlier, more energy-efficient and cheaper to run per passenger than public transport. 6. Last but not least, a sleek vehicle is more fun to drive than a normal car, especially when taking it ‘through the twisties’. How's that? When a car corners, the weight shift causes it to dip on the outside, all four tires more or less scrubbing for grip. A sleek vehicle needs to lean into the corner to offset the weight shift, like a motorcyclist does, use 4WS to curb yaw. The traditional two-row seating layout forces automakers to use a box-type frame. A pod-like shape is inherently stronger than a box shape (reason why tunnels and airplanes are built cylindrical). The resulting 'Smart ForThree' (no shoulder to shoulder) seating layout ensures class-leading impact safety on all sides and 360° visibility. Passenger heads cannot collide in case the vehicle is broadsided. The driver is seated 'on the other side' for a reason. The tapered rear-end forms an extra safety feature in case of a rear-impact. Ever hit a traffic pole or tree? Electric drive or ICE-propelled, most cars as we know them tend to wear you down. They require a lot of attending to. In my blogs I have pointed out that a lot has to do with the car's sheer physique. IMO, there's room for a, shall we say, almost appliance-like approach to personal mobility - less cumbersome, less demanding, inherently more flexible, more maneuverable and more suitable to self-driving and car-sharing.